"No one lights a lamp and hides it in a jar or puts it under a bed. Instead, he puts it on a stand, so that those who come in can see the light. For there is nothing hidden that will not be disclosed, and nothing concealed that will not be known or brought out into the open. Therefore consider carefully how you listen. Whoever has will be given more; whoever does not have, even what he thinks he has will be taken from him. Now Jesus' mother and brothers came to see him, but they were not able to get near him because of the crowd. Someone told him, "Your mother and brothers are standing outside, wanting to see you." Here's a short saying about lighting a lamp that you can meditate on it all week long! 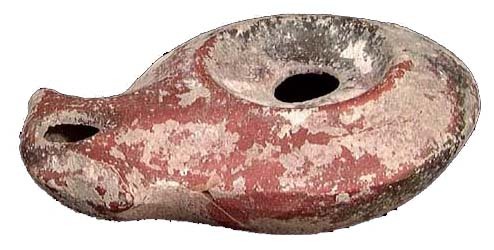 Herodian Lamp, that would have been common in the time of Jesus. Click for larger 34K image. The point of the parable is simple. When it was dark enough to light a lamp, you'd set it high enough to illuminate everything around --- on a shelf in the stone wall of your home or on a wooden lampstand in the center of the room, allowing 360 degree illumination. Following the "Something greater than Jonah is here" saying, and before "the eye is the lamp of your body" saying. Following sayings about a city set on a mountain, and hearing and proclaiming. Put it under a bushel? No! I'm going to let it shine." But Jesus may well have had something else in mind in our passage in Luke 8:16. Let's look at it here with fresh eyes to see what he meant by it here. Jesus' statement is almost funny -- and he probably smiled when he said it. If you're going to light a lamp, you do it for illumination, not to hide or conceal it. If that were your purpose, you wouldn't light it at all. The disciples who make up the "good soil" that immediately precedes this verse in both Mark and Luke. The "fruit" that results from their "good soil." Jesus, who is the Light of the World. The Word, the truth concerning the Kingdom of God. Each of these ideas have been argued by able scholars, but they can't all be right! Here's how I approach interpreting this passage. First, I look at the immediate context. It is followed by a verse about nothing being hidden (8:17), and a familiar saying "Therefore consider carefully how you listen (Greek akouo)" (8:18), very similar to 8:8 in the Parable of the Soils: "He who has ears to hear (akouo), let him hear (akouo)" (8:8). In fact, the word "to hear" appears many times in the Parable of the Soils. The clear theme of the Parable of the Soils is hearing the Word of God, and it appears that this theme stretches from 8:1 where Jesus is traveling from village to city "proclaiming the good news of the kingdom of God" to 8:21 where Jesus says that his true family are those who hear God's Word and do it (8:21). If hearing the Word of God is the theme of 8:1-21, then I am convinced that the light of the lamp in 8:16 is the Word of God, the message of the Kingdom that Jesus has been proclaiming all over Galilee. Some will hear it and not understand, in others the Word will see a little growth, in others the growth of the Word will be choked, but in still others the Word will produce a crop of obedience, a changed life, and a fruitful ministry. This message of the Kingdom of God must not be hidden or just whispered in secret. Rather, it must be proclaimed openly and clearly "so that those who come in can see the light," so that it will provide illumination and power. Jesus is instructing his disciples here -- Don't stifle the message of the Kingdom but proclaim it openly! Why would we as Jesus' disciples be tempted to do otherwise? Fear of persecution hinted at in 8:13. Fear of being ostracized from "respectable society," expelled from the central community institution, the synagogue. Fear that we won't be accepted. Fear that this will affect our business. Fear that we will lose our job. You don't light a lamp and then hide it's light, Jesus is saying. That is foolish. Rather you place it where it can be seen and provide light to everyone in the house. My dear friend, have you been tempted to hide the light of the message of Jesus' Kingdom? Jesus is speaking to you and me. What will we do about it? This verse begins with the Greek conjunction gar, which is used to express cause, inference, continuation, or to explain. In our verse, the sense is: Don't hide the message now, because everything is now to be revealed. In the Parable of the Soils, "the secrets (Greek mysterion) of the kingdom" have been given to the disciples (8:10). But the mystery, unrevealed Plan of God, previously unknown, is now revealed. It is now open. We must make it known and declare openly. Some people interpret this eschatologically, that is, when Christ returns everything will be known. Indeed, that is true. But I think it has the present reference is primary. Now is the time to disclose and proclaim the wisdom of God that is now revealed in Jesus Christ. That is the disciples' glory and their vital mission. The word, the lamp, has been lit, and must not be hidden, but set on high so all can see. This is critical, since "Whoever has will be given more; whoever does not have, even what he thinks he has will be taken from him" (8:18b). Those who go under the name "Christian" but haven't really followed Jesus and put into practice his teachings will hear, in the last day, "I never knew you" (Matthew 7:21-23). This seems harsh to me. But to the ears of Jesus' disciples, raised in a culture where family was preeminent, and held together with the unbreakable bonds of blood -- much more than in individualistic America -- these words were doubly harsh. The disciples must have been utterly shocked! Jesus intended for them to be shocked so they would never forget the lesson he was teaching: "My mother and brothers are those who hear God's word and put it into practice." Hearing God's word and putting it into practice is the message that must be indelibly tattooed upon our minds. The message of the Gospel, the Word of God, must never be silenced or hidden, but proclaimed even more widely. That is Jesus' clear directive. The lamp that is lit to be placed on a lampstand to give light to all who enter. The time for secrecy is past -- now everyone must know. Take heed how you hear this, my dear disciple friend. Take heed and put it into practice, that you might be Jesus' true kinsman. Lord Jesus, you have said this with such power and finality -- hear and do, hear and put into practice, hear and proclaim. Let me never be ashamed of You and your Word as sometimes I have been. Forgive me. Let me proclaim it as fearlessly as you and your disciples did. In Your holy name, I pray. Amen. What or whom does the lighted lamp represent in 8:16? A disciple? Jesus? The Message? Tell why you identify it in the way you do. Why must the lamp be placed on a lampstand rather than hidden? What does this mean in the Twenty-First Century? In view of 8:18, is there any hope for people who think they are Christians, but be don't really "get it"? Why would Jesus speak so disrespectfully of his family as he seems to in 8:21? If you must state a single theme of Luke 8:1-21, what would it be? Robert Houston Smith, "Lampstand," ISBE 3:69-71. No specimens of wooden lampstands have yet been found in archeological excavations, and lampstands of bronze or iron were rare. William L. Lane, Commentary on the Gospel of Mark (NICNT series; Eerdmans, 1974), p. 165. Joachim Jeremias, The Parables of Jesus (Second Revised Edition; Scribners, 1972), pp. 120-121, sees this in terms of Jesus' mission, that in spite of the danger, the "lamp" has now been lit, and must not be extinguished until the mission is complete. C.H. Dodd, The Parables of the Kingdom (Revised Edition, Scribners, 1961), pp. 112-113. Roman Catholics believe these were step-brothers, due to their belief in the perpetual virginity of Mary. Protestants see these as other sons of Mary. But since this has no bearing on the meaning of the passage, let's not make an issue out of it.